Davidson Plums have tart plum flavour rich in zinc, Vit E and calcium plus lutein for eye health. This is a highly concentrated powder. Davidson Plum is a deep purple very tart and acidic fruit eaten by the coastal Aboriginal people. Davidson Plum is higher in lutein than avocados, lutein is an important vitamin for eye health by improving the symptoms in atrophic age-related degeneration by inhibiting inflammation. They were used frequently by the early pioneers to make jams and preserves. 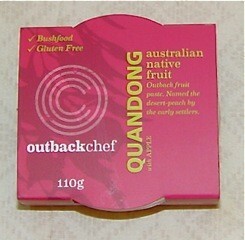 OutbackChef now makes a popular fruit paste with these plums. Davidson Plums have an anti diabetic effect and the capacity to reduce hypertension and obesity. Davidson Plums grow naturally in northern NSW, Qld and far north Qld. 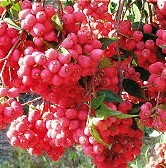 The fruit itself looks a bit like the traditional Blood Plum, but the flavour is extremely tart. 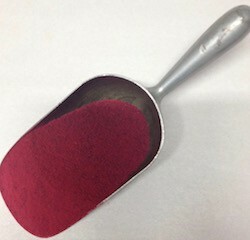 This Davidson Plum Freeze dried powder is concentrated, so really small amounts are needed to get results. Use as you would any concentrated fruit powder, I had a wonderful rice dish in Japan where the powder was mixed thru the rice to create a beautiful pink colour, a tad sprinkled on top to go towards a dish that celebrated Cherry Blossom Time.